Here at KIWI, we offer premium air duct cleaning services to help keep you breathing easier. Because we believe in our services so much, we’re offering 50% off our full system air duct cleaning services. That means for half the price we’ll thoroughly clean your ducts, vents, and air handling components so you can breathe easier! 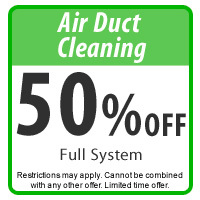 Redeem this coupon for 50% off KIWI air duct cleaning services when you order our full-system cleaning, which includes all duct leads, vent covers, and air handling components. Don’t believe us? Just listen to our customers share their experiences. Also, you’ll be receiving our unprecedented 2-year warranty so you know that mold and mildew won’t grow in your home for two years. Simply call one of our friendly team members today to book your appointment. Just mention the promotional code on the coupon to receive 50% off. Sales and discounts vary from area to area, so be sure to call for the most up-to-date sale information now!